Every student who wants to succeed in the global economy should study abroad. And every student who is considering studying abroad should read this book! Several leading experts in study abroad – international career expert Stacie Nevadomski Berdan; Dr. Allan E. Goodman, president and CEO of the Institute of International Education (IIE); and Sir Cyril Taylor, founder and chairman of the American Institute for Foreign Study (AIFS) – team up to bring students the most comprehensive book on studying abroad. Packed with practical “how to” information offered in a fun and engaging style, this valuable hands-on resource includes 100 easy-to-follow tips and dozens of real-life stories. 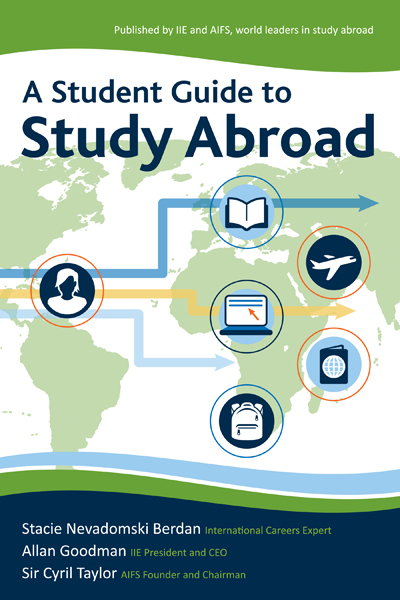 Download your FREE “10 Great Reasons to Study Abroad” poster! “Study abroad is a wonderful opportunity for any student. To be removed from your regular routine and parachute into a new geography and culture with brand new people and personalities is a mandate for learning. For many community college students, however, access to such experiences is limited given the costs. Miami Dade College has established shorter-term faculty-led experiences that range from two to four weeks that cut the costs in half. We are hopeful that additional grant money from private and public funding sources will make this valuable experience available to many more students.” — Eduardo J. Padrón, President, Miami Dade College. “In today’s increasingly competitive world and workplace, the skills and knowledge gained from studying abroad can be critical steps forward in the race to get that first job or promotion. Studying abroad, whether in Beijing or Rio, can set you apart and more importantly help set you on the path to success. If you wonder whether studying abroad is it worth it, put aside your worries. The right program—and not all are equal—can deliver the “3 C’s”: competitive advantage, career growth, and cross-cultural success.” — Curtis S. Chin, former U.S. Ambassador to the Asian Development Bank and Managing Director, RiverPeak Group, LLC. Stacie discusses “A Student Guide to Study Abroad” on Voice of America.